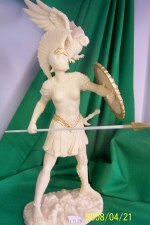 Crafted in marble like finished resin these figurines are replicas of those found in the worlds greatest museums. Each is highly detailed and is an exact scale replica of the original. 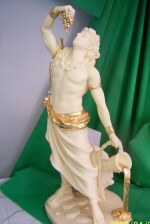 Dionysus, God of Wine agriculture, and fertility of nature. accented with hand applied gold finished trim. Similar to those shown above. Zeus, The supreme ruler of Olympus and king of the Greek Gods. 11" tall holding a spear. Ares, God of War, son of Zeus and Hera. 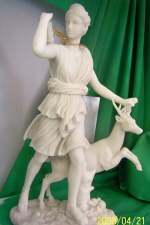 Apollo, God of music, prophecy, medicine, archery, poetry, and shepards of the flocks. 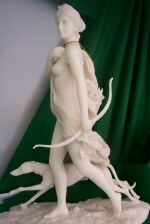 Aphrodite, Goddess of Love and virtue.